The film has a memorable soundtrack—the result of the association that Kubrick made between the spinning motion of the satellites and the dancers of waltzes, which led him to use the Blue Danube waltz by Johann Strauss II, and the famous symphonic poem Also sprach Zarathustra by Richard Strauss, to portray the philosophical evolution of Man theorized in Nietzsche's homonymous work. I'm familiar with The Blue Danube waltz, but which is the “Also sprach Zarathustra”? Ah, that's the film's opening theme song, sometimes known as the “sunrise”. Thus Spoke Zarathustra: A Book for All and None (German: Also sprach Zarathustra: Ein Buch für Alle und Keinen) is a philosophical novel by German philosopher Friedrich Nietzsche, composed in four parts between 1883 and 1885. Much of the work deals with ideas such as the “eternal recurrence of the same”, the parable on the “death of God”, and the “prophecy” of the Overman, which were first introduced in The Gay Science. “God is dead” never meant that Nietzsche believed in an actual God who first existed and then died in a literal sense. It may be more appropriate to consider the statement as Nietzsche's way of saying that the conventional “God” of 19th century middle class Christianity is no longer a viable or believable source of any received wisdom. Nietzsche recognizes the crisis which the death of God represents for existing moral considerations, because “When one gives up the Christian faith, one pulls the right to Christian morality out from under one's feet. This morality is by no means self-evident… By breaking one main concept out of Christianity, the faith in God, one breaks the whole: nothing necessary remains in one's hands.” This is why in “The Madman”, a work which primarily addresses atheists, the problem is to retain any system of values in the absence of a divine order. Strauss's music is inspired by Nietzsche's philosophical work of the same name. The work's main character is named Zarathustra, which is actually borrowed from a “ancient Iranian prophet and philosopher Zoroaster”. I'll have to read about Zoroaster some other time. Thus Spoke Zarathustra was conceived while Nietzsche was writing The Gay Science; he made a small note, reading “6,000 feet beyond man and time,” as evidence of this. More specifically, this note related to the concept of the Eternal Recurrence, which is, by Nietzsche's admission, the central idea of Zarathustra; this idea occurred to him by a “pyramidal block of stone” on the shores of Lake Silvaplana in the Upper Engadine, a high alpine region whose valley floor is at 6,000 ft.
How Much Do You Know of the World? It's quite interesting that a mag cover lead to so many discoveries, deep and old. I learned in my experience in particular of readings in the past 7 years, that a person can know so little of our society, surroundings. I felt, for a healthy society today, each person should have equivalent of 3 university degrees, 2 in humanities. This month, Ken Lodding has created a fantasy on far-out application with a Lisp theme. The surface of some asteroid has been discovered. 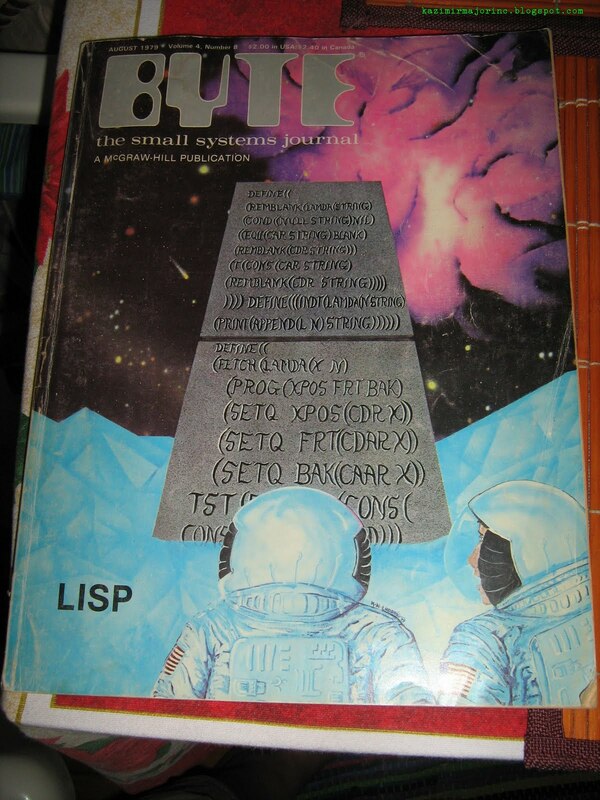 A monolith engraved with the S-expression form of a Lisp program is gazed upon by some astronauts. We presume some archeology of this monolith will have to be done to uncover the balance of the program. We leave it to readers familiar with LISP to identify the textbook from which these S-expression fragment were taken, and the purpose of the program.